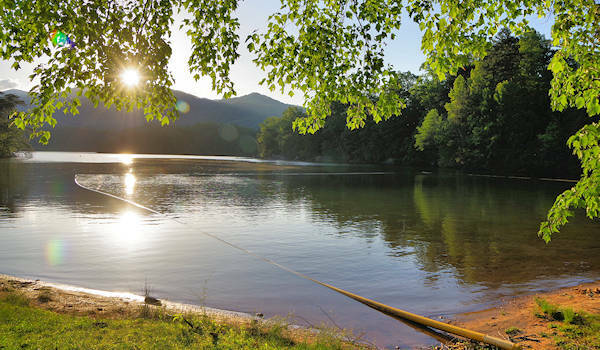 Beautiful Lake Santeetlah is one of most unspoiled lakes you'll find in the North Carolina mountains, and often called one of the most beautiful in the country. 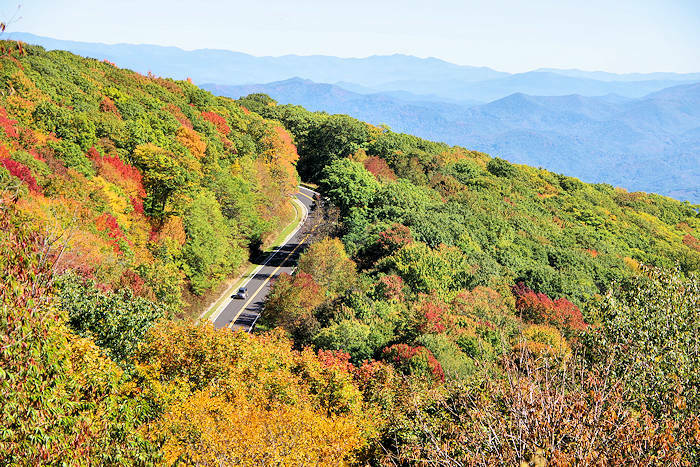 Located about 100 miles west of Asheville along the Indian Lakes Scenic Byway, it's located in the "wild west" of Graham County. Since it's further away from the city and less developed, it's especially serene. 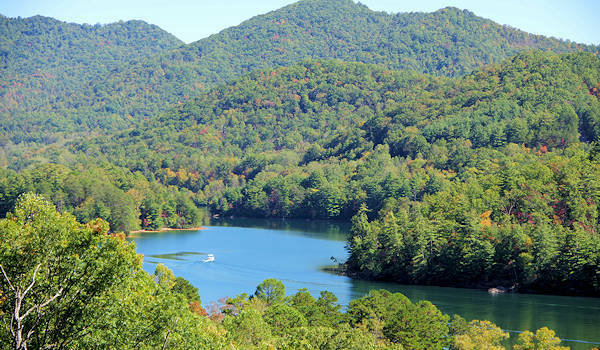 About 80% of the 76-mile shoreline is in the Nantahala National Forest, in the shadows of the Great Smoky Mountains. It's just six miles from Robbinsville. 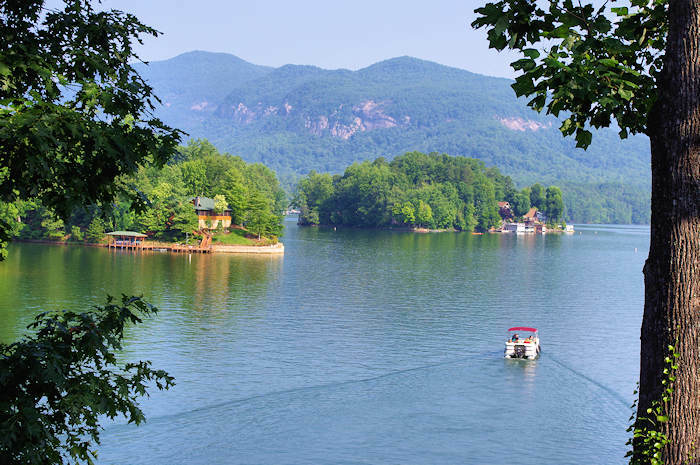 To explore the lake, you can rent pontoon boats, ski boats or kayaks at Santeetlah Marina (1 Marina Drive, Robbinsville) in "town." The Town of Lake Santeetlah occupies a peninsula in the lake with about 200 homes but only 50 permanent residents. 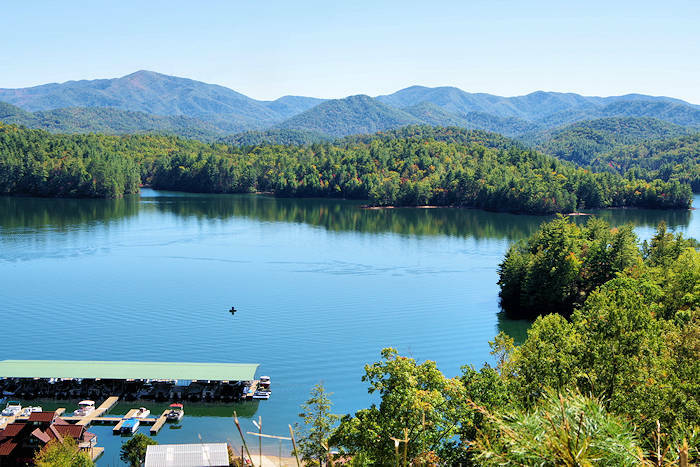 Pristine waters offer great fishing (bass, walleye, bluegill, crappie, bream and lake trout) and primitive campsites scattered around the lake along Joyce Kilmer Road (read more below). At Cheoah Point Recreation Area, find camping, picnicking, swimming, fishing and boating. The beach (pic above) is a great spot for a sunset picnic. The campground is open April-October and also has RV sites and primitive cabins. Six campsites provide electric hookups. Call the Ranger Station for more info (828) 479-6431. Or reserve online. Address: 1373 Thunder Bird Mountain Road, Robbinsville. 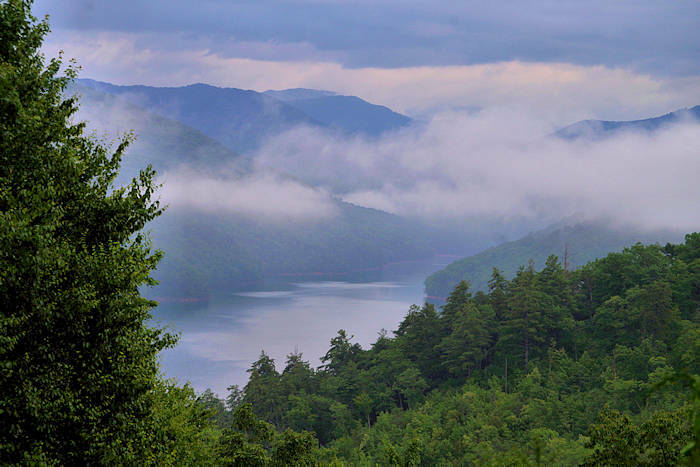 Also, find primitive first come, first serve campsites along the lake on Joyce Kilmer Road and Long Hungry Road off NC 143. Effective April 1, 2017, the US Forest Service-Cheoah Ranger District will require registration for overnight camping for dispersed campsites on Long Hungry Road. To register, fill out a simple form at the information kiosk located at the entrance to Long Hungry Road. Camping here is limited to 14 days within any 30 day time period, camping equipment may not be left unattended for more than 24 hours, campsites must be occupied during the first night after camping equipment has been set up, and camping equipment and personal property must be removed when vacating the area. Just a few miles north on US 129 is Yellow Creek Falls. The nearby Cheoah River is a favorite for whitewater lovers with Class IV and V rapids during scheduled dam recreational releases (about 17 days a year). 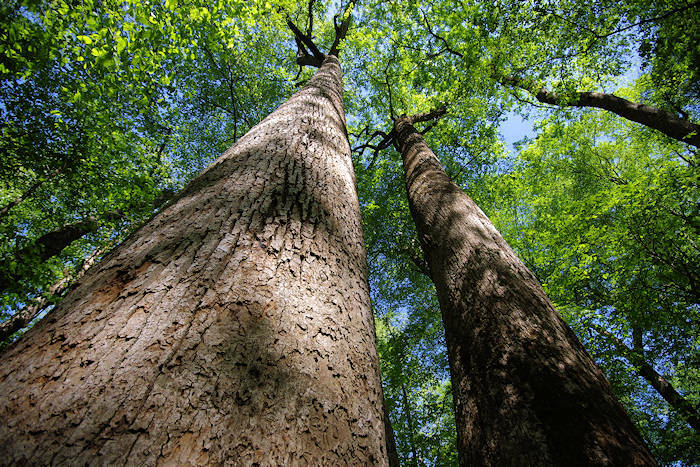 West of Lake Santeetlah is Joyce Kilmer Memorial Forest with great hiking through a virgin forest, just off the super scenic Cherohala Skyway. 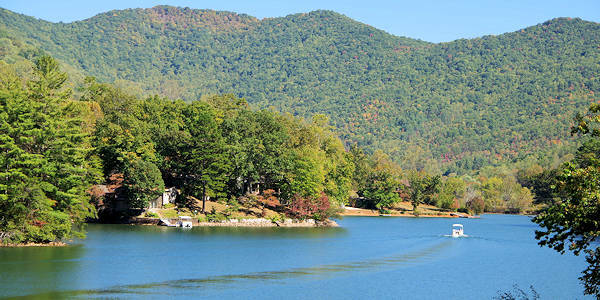 About 20 miles away is the much bigger Fontana Lake. Visit this farm for all-natural raw honey products and watch bees at work in their observatory, located in Robbinsville, NC. Self-guided and guided tours available.